We have lived nomadic lives here at EToT fully believing in our #experiencehere mantra. Luckily we were able to call Budapest home for 6 months and it is from this city that the benefits of immersive travel really became apparent. We have just launched out first travel experience in Hungary and it seems about right that we let you know what we think are the best things to do when you visit the capital city of Budapest. If after you experience all these suggestions you still aren't head over heels in love with the 'Paris of the East', then you need your head examined! From the 'Blue Danube' that snakes through the heart of the city, to religious churches and synagogues, citadels, statues, monuments, thermal baths and trendy ruin bars - we'll lay out a few must see things when you travel to Budapest. It's a classic Central European city with similar grandiose architecture as it's more famous counterparts Vienna and Prague, but while those two solely rely on these superficial looks (lovely as they are! ), in Budapest you have to go digging, you have to go searching, you have to peek behind it's facade to find the true beauty of it's soul. These are the soul of the city. A reflection of the evolution and regeneration of Budapest. The general premise is that the abandoned/derelict buildings are regenerated for the next generation. This is done by making the most of the space and adding their own quirky additions to create bars, art studios, clubs, community centres and markets. 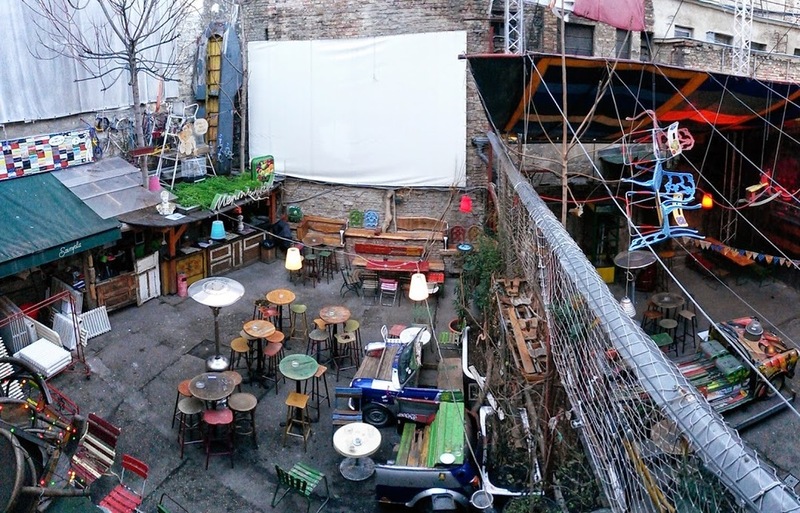 The most famous one is also the biggest called Szimpla Kert which has sawn in half cars-turned-tables-and-chairs, bath tubs as sofas and sinks as plant pots....it has a real arty feel to it and also has a market on Sundays. Other notable kert bars are Instant which has a retractable roof, basement club, themed rooms (one with an upside down room....) and hanging artwork in the main courtyard. Fogashaz is a great outdoorsy one (used to be a dentists) while Kuplung is another cool one nearby (although not technically a kert bar). Most kert bars are open air so perfect in Summer! Other non-kert bar places to go afterwards would be A38 (an old disused Ukrainian boat turned bar/club) and Corvinteto (a roof top bar/club on top of an old supermarket with great views of the liberation monument - take the stairs or random lift). But, like we said, just wander around the area (especially in Summer) and you will stumble upon loads of these places. One of our faves has swings (!!!!!) as bar stools!! Budapest has a great literary heritage and this coffee culture blossomed in the early 20th century. Writers, poets and artists would regularly meet at these cafes as pen and paper were free to use and they could discuss things over a 'writers menu' of bread, cheese and cold cuts at a discounted price. Unfortunately most were destroyed during the world wars, but some remain and some were refurbished to their previous glories. Check out Gerbeaud's, New York Kavehaz and Central Kavehaz for a cup of coffee, slice of cake and breathe in the decadent Great Gasby-esque atmosphere. If you're in the castle district, go to Ruszwurm - the oldest cafe in Budapest and the favourite patisserie of Princess Sisi! Oh yes, the reason so many come to Budapest in the first place! There are loads of bath located around Budapest that are all amazing, but with little characteristic differences. Many of these baths date back to and still have visible influence from, Roman, Greek and Turkish times. Our favourite is Rudas on the Buda side of Elizabeth Bridge. Dating back to the Ottoman times it still has the old dome as it's central architectural highlight with it's hole in the middle being the main source of light (similar to the Pantheon in Rome - and up there in terms of beauty too). There are plenty of others in the central area too. The most well known (and biggest) is Szechenyi Baths in City Park which has the added bonus of having a big outdoor thermal bath area - and is also handily right by Heroes Square, another must see in Budapest. Gallert Baths is not only under the Gellert Hill (with the Liberation Monument so you can come after your walk/hike up to the monument) but is also the most visually stunning showcasing it's art nouveau details off to everyone. Just like the rest of Central Europe, Hungary isn't really known for its food! But, just the country itself, the food is vastly underrated! The food is filling and hearty - just like the people! Tarhonya es Pörkölt - Pörkölt is a meat strew which is deliciously rich with paprika (the national spice), and tarhonya is an egg based pasta. The best way to describe tarhonya is, imagine if cous cous and pasta had a baby.....yep, that's tarhonya and it's gorgeous when served with pörkölt! Hideg Meggyleves - Cold fruit soup. The most refreshing thing EVER. On a hot day (Budapest hits 40 degrees celsius in Summer) you will be gagging for some of this. It's essentially a sour cherry soup. Mixed with cream and sugar, it's the perfect starter, dessert or snack! Tarhonya es Pörkölt - this picture does no justice to the dish or flavour AT ALL! We've not even started on about the beautiful sites, architecture, culture and vibe of Budapest! That can be another blog post in itself but hopefully now you have a different idea of the city and what makes it stand out from the rest of the capitals in Europe. We used to live here and have a passion for making sure everyone gets the most out of Budapest so please don't hesitate to ask if you have any questions or want more personalised tips for your visit! If this has stirred your interest, then why not try our Tokaj & Budapest Wine Cycling experience? After all, there's no better way to see a country than on two wheels...and with a glass of wine! Brand New London Beercycling Video!